Wörrstadt (renewablepress) - In the immediate vicinity of many embassies, on a carport at the giant Brooklyn Mall in Pretoria, 9,600 solar modules gleam in the South African sun. juwi started work on the construction of the one-megawatt system at the end of January. The system is currently being commissioned. It has been designed and executed by juwi Renewable Energies (Pty) Ltd, the German project developer´s subsidiary in Cape Town. Within the space of a few months, juwi has completed its second large solar farm for the real estate company Growthpoint. At the end of 2016, juwi had equipped the Northgate shopping mall in Johannesburg with a one-megawatt roof-mounted system for the company. For the shopping center in the South African capital, this is a lighthouse project. The power from solar modules is supplied to tenants of shops in the mall, who can therefore cover their energy demand at lower cost and in a significantly more environmentally friendly way. To date, power for the shopping mall has been taken from the public grid – which continues to be dominated by coal in South Africa. The installation of Brooklyn´s 9 600 115W, Version 4, First Solar thin-film modules will be complete within 71 days (from construction start), with the system planned for Commercial Operation Date (COD) in mid-April. According to Coen Fourie, Project Engineer at juwi Renewable Energies, nine percent of the mall´s total consumption of 21.4GWh/year will be supplied by the rooftop PV plant. It is estimated to generate almost 2GWh/year. 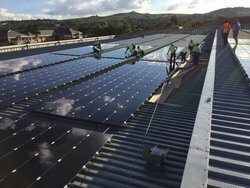 According to Werner van Antwerpen, head of sustainability and utilities for Growthpoint Properties, which co-owns Northgate Shopping Centre, Brooklyn Mall and Design Square, these solar installations further its environmental commitment and its energy efficiency goals. juwi Renewable Energies have been contracted to provide Operation & Maintenance Services for 12 months. The juwi group is one of the world´s leading companies in the area of renewable energy. The renewable energy pioneer with a strong regional presence offers project development and EPC services as well as products and solutions for the energy turnaround. Company activities are mainly projects with solar and wind. So far, juwi has realized more than 900 wind turbines with a total capacity of more than. 2,000 megawatts at more than 150 sites globally. In the solar segment, more than 1,600 projects with a total capacity of around 2,200 megawatts have been designed and constructed. Combined, these energy systems produce around seven billion kilowatt hours of clean energy per year, equalling the annual demand of more than 2.3 million German households. Within the past 20 years, juwi has initiated an investment volume of around eight billion euros to realize these projects.